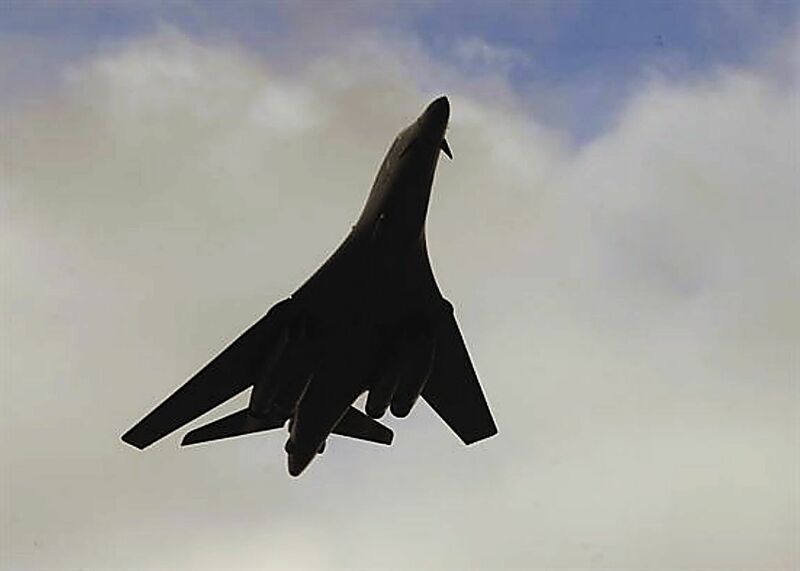 A B-1 bomber demonstrates a show of force during a joint training exercise at the Powder River Training Complex, Belle Fourche, S.D., Nov. 16, 2016. Air Force aviators and joint terminal attack controllers, along with soldiers from the South Dakota National Guardâs Company C, 1st Battalion, 189th Aviation Regiment, simulated rescuing two injured service members in an urban contested environment. Producers in the Powder River Training Complex in Montana, North Dakota, South Dakota and Wyoming, will be getting a free air show March 14-16; one that some may not appreciate right in the middle of calving and lambing season. Producers in the area can expect to see multiple types of aircraft according to the Air Force press release, and along with the noise of the planes, the Combat Raider practices can produce sonic booms. 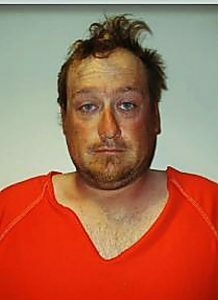 Clark Blake lives in the Powder River Two area, and said it can get pretty noisy. Blake has his own plane, using it for predator control and ranch checks. While his cattle have, for the most part, become used to the Air Force activities, other producers have not been as lucky. 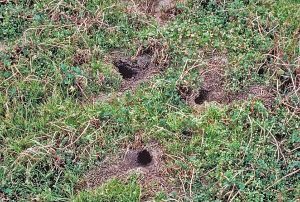 “We are committed to working with ranchers to address concerns and we will consider individual requests for mitigation efforts — these temporary avoidance requests are evaluated on a case-by-case basis.”Miranda T. Simmons, 2nd Lt, and Chief of Public Affairs, Ellsworth Air Force Base. “Some ranchers have had problems with calving,” Blake said, sharing neighbor stories of spooked heifers and calving problems. According to studies by Temple Grandin at Colorado State University, that noise is a legitimate concern. “Cattle and sheep are more sensitive than people to high frequency noises. The auditory sensitivity of cattle is greatest at 8000 hz and sheep at 7000 hz. The human ear is most sensitive at 1,000 to 3,000 hz. 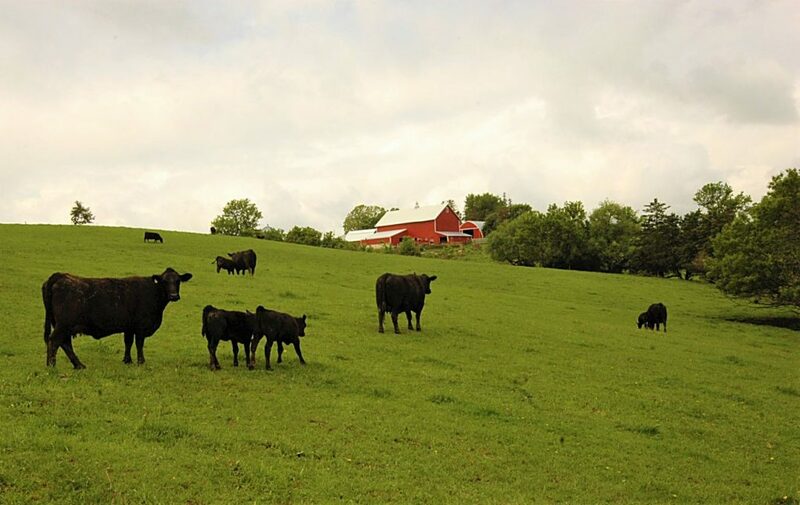 Unexpected loud or novel noises can be highly stressful to livestock. Sheep exposed to exploding firecrackers or noise in a slaughter plant had increased thyroid hormone levels and elevated cortisol. A loud clanging bell from an outdoor telephone will raise a calf’s heart rate 50 to 70 beats per minute,” Grandin writes in her paper at http://www.grandin.com/references/new.corral.html. In addition to the noise, the training includes low-flying aircraft. While the B-1 supersonic activities occur 20,000 feet above sea level, transient fighter supersonic activity can occur at 10,000 feet above ground level. Jodie McCoid, a rancher near Buffalo, S.D., who is in the turn-around path of the planes, said he wouldn’t have a problem with any of it, if they would stick to those numbers. “I’ve seen them well below that, but it’s my word against theirs,” McCoid said. “It’s 3,460 here at the house, the hills are roughly 400, and you can see the tops of the planes, so you know they aren’t where they are supposed to be,” he added, sharing that to get over the hills, they have to elevate. The Air Force sent Tri-State Livestock News a statement, sharing there was no “blanket agreement” on the training during spring calving, but that the vast majority would be conducted at high altitudes. 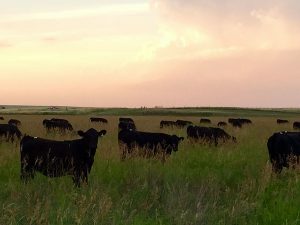 “We are committed to working with ranchers to address concerns and we will consider individual requests for mitigation efforts — these temporary avoidance requests are evaluated on a case-by-case basis,” said Miranda T. Simmons, 2d Lt, and Chief of Public Affairs, Ellsworth Air Force Base. The expansion, designed to enable the Air Force to enhance its combat training for B-1 and B-52 aircrews based at Ellsworth Air Force Base in South Dakota, and Minot Air Force Base in North Dakota, is nothing short of a thorn in the side of Roger Meggers, with Baker Airfield, in Baker, Mont. Meggers works primarily in the oilfields, using the PRTC airspace on a daily basis, and says the expansion was more of a want than a necessity, considering the Air Force was doing fine without it for 70 years. Both Meggers and Blake agree the communications from the Air Force is less than adequate. The press releases are sent out, and the website is posted with flight information, but the communication is unreliable, according to Blake. “We’d definitely like to have more communication with them,” Meggers said. “We don’t even know if (the planes) are in the area. And at 30 seconds away, they are about the size of a bug speck. Humans have a 12 second average reaction time. That gives me 18 seconds to get out of their way,” he added. The Air Force first proposed the expansion in May 2008, beginning a series of environmental and public reviews which were completed in November 2014, according to a release from the Secretary of the Air Force Public Affairs. Throughout the process, the Air Force received and incorporated valuable inputs from residents, organizations, government offices, Native American tribes, state historic preservation offices, the National Park Service, the U.S. Fish and Wildlife Service and other agencies. The Air Force worked with the Federal Aviation Administration, other federal and state agencies and tribal governments over the intervening years to mitigate concerns while continuing to meet national defense training requirements. The decision included mitigation measures involving commercial aircrafts, tribal reservation lands, cultural and historic areas and ranching operations. “In addition to these mitigation measures adopted in the record of decision, the Air Force will also develop a “good neighbor” process to communicate with concerned regional agencies and organizations,” according to Air Force Public Affairs. Meggers was involved from the beginning in the expansion discussions, that included ranching concerns. “The Air Force mitigation comment on (animals) was that the cattle would adjust to it,” Meggers said. But Air Force officials stand by the agreement, sharing what they feel is the necessary information. Meggers questions that good neighbor plan, pointing out that the Air Force didn’t even follow its own FFA rules, allowing the expansion into areas where there is no flight communication or radar. “They’ve stuck two B1’s in the ground and just last week they lost an engine,” Meggers said, questioning the safety and cost of the entire process. Despite concerns, the training goes on; fortunately for some, it is limited to 10 days each year, with each exercise lasting no more than three days. PRTC only occur once each three-month period, as separated into January through March, April through June, July through September, and October through December. In her statement, Lt. Simmons also addressed the calving and lambing season, reminding producers of the mitigation option.